Yoshinoya- a favorite among foodies who loves Japanese food in the Philippines recently relaunched its branch located at the SM Megamall, ground floor of Bldg. A. The newly renovated restaurant opted for a simple elegance look with touches of colors here and there. Other Yoshinoya branches are currently undergoing renovations and improving their dishes that will cater to Filipinos penchant for Japanese food. 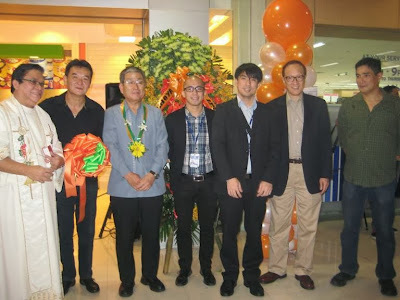 Shown in photo during the opening festivities are (from left) Timothy James Yang, Yoshinoya Century Pacific, Inc. President and General Manager; Kiyoshi Takeuchi, Director, Japan Information and Cultural Center, Embassy of Japan; SM Megamall representatives (3rdand 4thfrom left); Richard Yang; and Ricardo Cepeda, movie actor and aspiring chef.